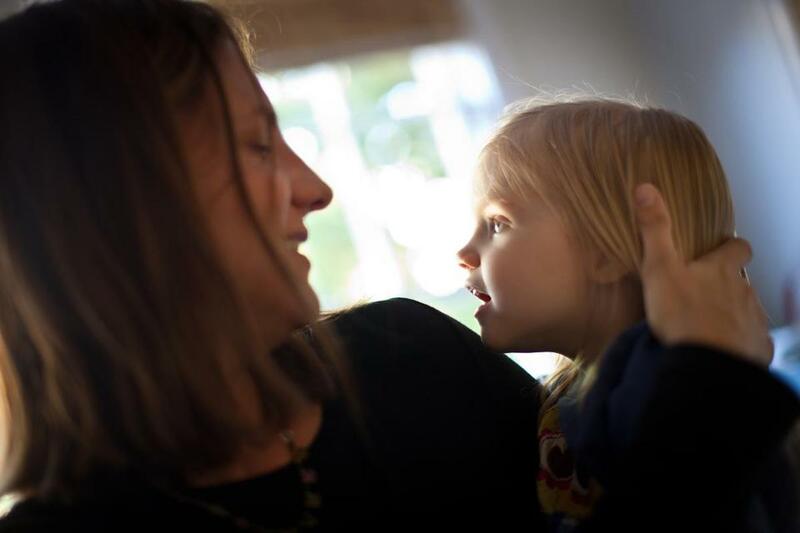 Kari Lennon shared a moment with her youngest daughter, Grace Gilmore, whom they call GG. The girl was a gift for the scientists, too. TAMPA - Kari Lennon gently circled the head of 6-week-old Brooks with a blue ribbon, then stretched it along a measuring tape. Upstairs, her husband Steve was putting the older three children to bed, and Kari felt foolish, even furtive, doing something that she knew would seem crazy to him. But she could not help herself; she measured again. Since the day Brooks was born two days after Christmas in 2007, Kari had received nothing but assurances that the littlest Lennon was a healthy, blue-eyed boy. But the first time she and Steve had a moment alone in the hospital, they shared an intuition that something was wrong with their son. They wept. Kari’s makeshift measurements put Brooks at the low end of the normal range - the 20th percentile - in head size. To Kari, this was much more than a number. It was the same measurement that had, seven years earlier, led the young couple on an agonizing journey to the edge of medical understanding. Their first child, Addison, had also seemed like a healthy, normal baby girl, her head a little on the small side. Then, the seizures began, eventually leading doctors to conclude that Addie had “microcephaly’’ - her head was small because her brain was not developing normally. With that medical word had come little else: no answers about how to fix Addie, explain her problems, or predict what would come next. The next two children were fine, but now, Kari was sure it had happened again. Her intuition would later be confirmed by a neurologist, who said Addie and Brooks must have inherited the same genetic problem. The Lennons would travel north to Boston, where scientists were studying children with rare brain malformations. They would discover connections to families halfway across the world, and eventually find their own family completed in a way no one could have anticipated. The researchers, who work long hours amid racks of test tubes, would also be changed by their encounter with the Lennons. But that evening, there was no way to know what lay ahead. Steve came downstairs to find that Kari - so unshakable when it came to managing the everyday chaos of their growing family - had become inconsolable. She could think only of the challenges their littlest boy was going to face and of how unjust this was. Steve, always strongest when it came to the big moments, was unwavering. During long nights of online research after Addie’s condition was discovered, Kari had stumbled on a laboratory run by Dr. Christopher Walsh at Children’s Hospital Boston that specialized in studying genetic brain development disorders. She got in touch with the team, and in April 2008, the whole family boarded a plane for Boston: Steve, Kari, four-month-old Brooks, Jack, 4, Sam, 6, and Addison, 7. 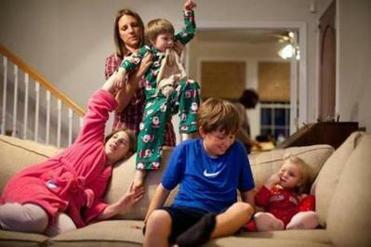 Kari Lennon managed a happy and chaotic post-dinner, pre-movie moment as children piled into the living room. She was holding Brooks, her fourth child, who was born with ‘‘microcephaly.’’ At left was her first child, Addison, who also has the genetic disease, along with Sam, the oldest son, and at right the baby of the family, Grace Gilmore, also known as GG. For more than a decade, Walsh had been unraveling the most basic questions about how the normal brain develops, in part by studying what happened when that crucial process went awry, leaving children’s minds tragically miswired or malformed. The laboratory studies families from all over the world and spends several afternoons a month reviewing medical histories and brain scans and meeting with families. Walsh’s office is decorated withthe covers of scientific journals, each displaying a different rare brain problem that his painstaking work has helped elucidate. It’s a biologist’s trophy case, and it reveals an essential truth about scientists like Walsh: their reward is the thrill of discovery, the relentless pursuit of explanations about how the body works at the level of cells, proteins, and DNA. 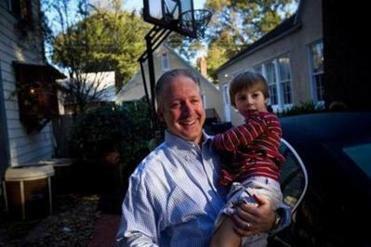 Like most people doing biomedical research, Walsh and his colleagues want more than anything to help families like the Lennons. But day to day, that’s not what drives the tall, strawberry-blond neurologist with a reassuring smile and a gentle way of speaking. Even a major breakthrough in his work is just one step in a long journey; it will very rarely change the life of a family, much less fix a child. So when the Lennons crammed into a small, 10th-floor room at Children’s Hospital with a four doctors and specialists, they got no promises. For what seemed like hours, they unfurled their family history. Steve met Kari when he visited a law school classmate of hers in St. Petersburg, but they didn’t begin dating for six years, after they both moved to Tampa. Even then, they knew they wanted a big family - the warmth, the noise, the bustle of a full house. When Addison was born in 2000, with sapphire blue eyes and dark hair, it seemed as though they were well on their way. But the week Kari went back to work as a lawyer, she looked down into her baby’s crib and saw that Addie was pale and her eyes seemed frozen. She called her pediatrician and stayed on the line with the nurse while she drove to the doctor’s office, with Addie in her car seat vomiting. It was a frightening episode for the new parents: a seizure. The doctors didn’t seem worried, but Kari decided she wasn’t ready to go back to work. Then, when Addie was around 14 months, there was another seizure, this time more severe. The doctors’ tone unmistakably shifted. They weren’t saying anything definite, but they talked about how Addie’s head hadn’t really grown since birth. Her brain was structurally normal, they said, but it didn’t look exactly as it should. Kari, weeks away from having her second baby, went into the bathroom and began to cry. Kari was tormented by worries that she had done something to Addison while she was pregnant and now she was doing the same thing to her second baby. But Sam’s head was mercifully big. Two and a half years later, his younger brother Jack was above the 50th percentile, too. Steve and Kari made sure she had every support available, and Addie began to grow into a tenacious, independent child. Her seizures were brought under control and her parents gave her a happy, normal childhood. She had some intellectual disabilities and difficulty pronouncing words, but she could speak and understand people. Then they had gone for child number four. And now their fears about Brooks had brought them to a cramped room in Boston, where the doctors outnumbered the patients. The doctors were careful. They try to keep expectations low at these meetings; it can take years to puzzle out the genetics of such rare disorders, and sometimes answers are never found. But the doctors were intrigued to learn about Addison’s particular brain abnormality and her seizures. The case reminded them of a handful of children from Jordan, Saudi Arabia, Turkey, and California, that a graduate student named Jun Shen had been studying - a line of research that had now been picked up by Gilmore. But those other children were much more severely afflicted, with worse seizures and intellectual disabilities. The doctors didn’t have much hope that they would find a connection, but they collected blood samples from the family and said they would try. Back home in Florida, Kari allowed herself the indulgence of self-pity only briefly. When Brooks had his first seizure, she was positive and pragmatic, ready to put on her “mommy face’’ and be the best possible advocate for her son. Steve Lennon, shown with his youngest son, Brooks, knew he wanted a big family. But Brooks’s seizures were terrifying and severe, and he was very weak. He did not gain a pound for five months, and the seizures became so frequent they almost seemed routine. Roughly twice a month, an ambulance would be called to the house. He was intubated twice - a tube forced down his throat to help him breathe. The paramedics became familiar with the house and the tiny baby who needed their help, though Kari glimpsed nervousness in their eyes each time they arrived. Even on good days, Brooks didn’t sleep unless he was being held. Kari would find herself murmuring, “Mommy didn’t know, mommy didn’t know’’ as she cradled him, wishing she knew how to alleviate his suffering. She e-mailed Brenda Barry, the genetic counselor at the Walsh laboratory, worried that the seizures might be fatal. Eventually, Kari and Steve put Brooks on a feeding tube. They had been reluctant to take such an extreme measure, but he gained weight, and his seizures were finally controlled by medication. Then, six months after Brooks’s condition had finally stabilized, Kari missed her period. Steve and Kari were dismayed. They hadn’t planned on another baby, and they had been told after Brooks’s diagnosis that there was a one in four chance any future children would inherit the same genetic abnormality. They could not bear the thought of helplessly watching another child suffer, and they were unsure they could support a third child with disabilities. But the thought of terminating the pregnancy was also unimaginable. They felt sick with guilt, shame, and worry - but also couldn’t suppress the tiniest glimmer of hope and excitement. Kari calculated the delivery date: the baby would be born Christmas Day, 2009. After all they had been through, a healthy child would be such a blessing. Kari’s obstetrician said she could not tell them whether their baby would have the same problems as Brooks and Addie, but she urged them to check back with the doctors in Boston. Kari and Steve sat in the parking lot outside the doctor’s office, while Steve tapped out the message to Barry on his phone: We’re expecting, and we’re scared, he recalled typing. Do you by any chance have anything that could help? In Boston, the research had been moving along. Children with rare, so-called recessive disorders, like the one Brooks and Addie had, inherit two flawed copies of a gene, one from each parent. One defective gene would normally not be enough to cause disease, because it would be compensated for by a good copy. The scientists had found that children with the rare form of microcephaly with seizures that they were studying had two mutated copies of a gene, which meant a protein involved in repairing DNA, called PNKP, wasn’t being properly made. But the Lennons’ case presented a variation on that puzzle: the tests on Brooks and Addie had found one abnormal copy of the gene and one that appeared fine. Gilmore kept looking, and eventually discovered an anomaly on the normal-looking gene - some missing DNA in an area where he hadn’t initially paid much attention. Thissecond mutation helped explain the Lennon children’s less severe symptoms - it appeared their cells could still make some of the necessary protein, just not enough. When Barry got the e-mail, the group had yet to vet its work the traditional way, sending out its findings to be reviewed by peers and published in a scientific journal, and they immediately began discussing whether the results were sufficiently persuasive to guide what might be a family’s most important decision. The answer, in the end, was yes. Kari was at a meeting at Addie’s school when her cellphone rang. She ducked out into the hallway. Barry told her the doctors knew what Brooks and Addie had. What’s more, they could do a prenatal genetic test to find out whether the baby would have the same problem. Kari had been waiting for this moment for seven years. No longer would she have to stay up late scouring the Internet for answers. The torment of what was to blame, whether they had exhausted every avenue, whether there was an explanation lurking somewhere, lifted. Within weeks, a doctor in Tampa removed a small number of cells from the placenta, and sent the sample to a clinical laboratory in Maryland. Kari was in a Target store when she got a call. The baby - a little girl - would be fine. Once again, the world lurched to a stop. She felt like turning to the people around her, to tell them what had just happened, to give them the biggest hug, to tell them about this heart-exploding turning point. But she just kept shopping. A day after Brooks’s second birthday, on Dec. 28, 2009, Kari gave birth to a healthy girl. She told Steve to watch the nurses measure the baby’s head. It was normal, just as the doctors had predicted. In the simplest version of the story, she is the gift that the doctors gave this family. It’s a contribution no one will ever forget; it’s woven into her name, Grace Gilmore. 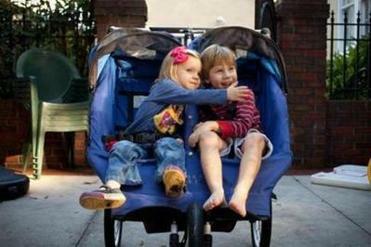 Grace Gilmore and her brother, Brooks Lennon, played together in their stroller while waiting to be taken for a walk around their neighborhood in Tampa. GG, as she’s called, was a gift for the scientists, too. “This may be the most important impact I have, my research has, on a patient, ever in my career and I’d be fine with that to be honest,’’ Gilmore, now working in Cleveland, said in an interview. Jun Shen had not even met the family. She had moved on to a different laboratory before the Lennons showed up in Boston. But she learned from Walsh about their predicament, and about how the research she had done had become life-changing. She began to wonder whether she really wanted to spend her life doing basic research. But it was an e-mail Gilmore forwarded from the Lennons that made up her mind: “Were it not for your collective efforts,’’ the parents wrote, GG “would not be here with us today.’’ Shen decided to enroll in a Harvard program that trains scientists to run a laboratory that does clinical genetic testing. Now a toddler, GG is an angelic blonde with blue eyes who rattles off numbers and words and plays trains with Brooks. Sam, precociously mature, acted exasperated and urged everyone to settle down. Addie, who is beginning to read and navigate adolescence, talked about practicing backstroke flip turns for the swim team. Now 12, she dished out a bit of sass to “Miss Lindsay,’’ the woman who helps Kari with the children and has become a beloved, essential part of the family. Even Brooks, who ate most of his dinner through his feeding tube, had his turn. He has been learning to use his voice when he wants to communicate, and that day he had been taught to say “up’’ when he needed to get out of his chair. This night, everyone tried to encourage him. After dinner, there was a mad scramble to sit around the TV. Kari had her arms full of a rotating cast of children who squirmed on top of each other and around and over her lap. Steve fiddled with the remote control. Five children were laughing, egging one another on, clamoring for attention, bickering a little bit, and looking out for one another. It’s nonstop. It’s normal. It’s everything the Lennons ever wanted.